It is a Stainless Steel case with full diamond case, and blue Mother of Pearl set with eight round diamonds and automatic movement with date indicator. 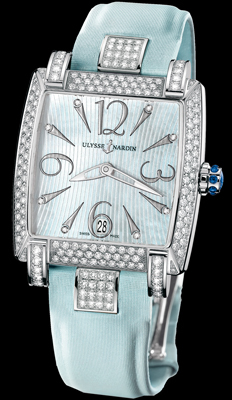 It features a glass exhibition case back with the visible rotor etched with the Ulysse Nardin name and anchor logo. It is available on elegant blue color satin strap and folding buckle.